This reads like a Match.com profile written by Goldilocks. The dog must have large soulful eyes, a medium coat and be beautiful. She must have a strong desire to please, be easy to train and smart, but not an independent thinker. She must want to be with them, but not clingy. She must be friendly to people and other dogs but not actively seek attention. It goes on in this vein, very specific about their wants and even more detailed on their don’t-wants. This is a method that is recommended for people looking for a dog, and is considered invaluable in assuring a successful adoption. As I was reading this and perusing some of her choices on Petfinder.com (world’s most dangerously addictive web-site) my new adoptee was sleeping nearby. The spaniel, sleeping next to her, shifted slightly and his paw may have barely grazed her tail. She let out her signature bark, a high pitched, hoarse yelp that startles as much as it grates. Then she stood up, gave him a baleful look, gave me a pleading look and climbed on the couch. I didn’t make a list of likes and dislikes before I went to the shelter. Until I met her, I couldn’t know. We went to look at her and that was the first time I heard the signature yelp, hoarse and piercing, only now it was a cry that went on and on. Out in the large run, she tried to play with my dogs, but if they so much as considered sniffing her, she howled and ran away. She was like a lonely creature from another planet, desperate for something but terrified of everything that was offered. She came to me and allowed me to pat her, but then had to return to racing around the run, play bowing at my dogs and then crying pitifully when they responded. I took her on a short walk, and she very nearly climbed the trees her exuberance was so great to be outside and moving, even if her freedom ended at the buckle of the six foot leash. I had promised to be responsible, so I returned the dog to the volunteer, told her I had to think about it and that I would call the next day. “OK, but just so you know, we can’t hold her for you.” My friend, Tracey, who had come along to make sure I behaved responsibly, had to pinch me hard, but I agreed to accept that risk and turned to gather up my dogs. As the volunteer headed across the parking lot and back toward the building, the dog commenced vocalizing again, guttural cries and yelps. She stared beseechingly at me, as her paws scrabbled on the pavement and her entire body yearned towards me. Two days later, Pied was standing in my kitchen, whining, terrified to move on the slick floor. If other dogs play, she wants to be part of it, but all she knows how to do is bark and run away. If a dog actually tries chasing her, she runs directly to me and starts yelping and crying at them, an expression of fear and accusation in her tone and on her face. The dog walks away, disgusted, and I stroke her ears and try to reassure her. But Pied hasn’t been a project. She has beautiful house manners, and after only a few days of training she developed an extremely reliable recall. Because she is so consistent about staying with me and coming when I call, she can walk off leash. Well, I walk, she runs her legs off. In the middle of a full tilt gallop, she’ll abruptly freeze into the most classic point and start the slow pointer creep, each paw lifted, held and oh so silently placed down again. Very often she is creeping up on a leaf or a shadow, but never mind, she’s off again. When she isn’t pointing, she runs just for the joy in motion, nose inches from the ground, legs never seeming to coordinate with each other in any sort of consistent rhythm. And then she’ll abruptly hurl her body to the earth and roll, all four legs thrashing wildly in the air, paddling away as she wriggles through the wet grass. She gets up drives her chest into the same spot and slides her chin along the ground. Then she is up and running. She sleeps right next to my head and when we wake up in the morning, she groans a little, creeps closer and lays her chin gently across my face. If I had written down what I wanted in a dog, I wouldn’t have said — I want a dog with the temperament of a car alarm, the social skills of a frightened wolverine and the car manners of a chimp on amphetamines. But it turns out, that’s exactly what I wanted. 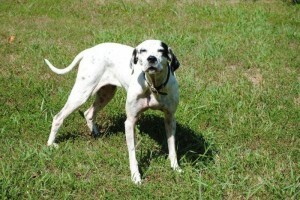 Margaret Bishop is a writer living in Northern Virginia with her four unemployed dogs. I have always heard that your average dog is as intelligent as your average three year old. Recently, I read that the average dog is as intelligent as the average four year old. I don’t know if the dogs are getting smarter or if the children are slipping, but I wanted to test this out. I looked on-line and found a reputable looking canine intelligence test. But I couldn’t find an average four year old. The few four year olds I know were deemed inappropriate because they are all gifted. “It wouldn’t be fair to your dogs,” one mother said sympathetically, as the mini Einstein sat at her feet eating dirt. I decided to do the intelligence testing with the dogs first, and then see which one should go up against the gifted and talented. This IQ test has 12 subtests. Some involve rearranging all the furniture in one room and then timing your dog to see how long it takes him to notice something is different. I don’t have the energy to move heavy furniture, but when I park my car on the opposite side of the driveway from where it is usually parked, the dogs all bark and carry on as if we were being invaded by the Mongol hordes. Point being, they notice, but given their interpretation of this change, is it really a sign of intelligence? Another test involves “retraining” your dog from heeling at your side to heeling in front of you. Now, my dogs have been exposed to more of a Waldorf-Steiner or Montessori type of education. I haven’t wanted to stifle their creativity or interfere with the fulfillment of their unique destiny by forcing them to learn such degrading and robotic behaviors as heel or stay. So the “retraining” exercise was out. I started with the biscuit under the soup can. You show the dog the treat, allow him to sniff it, see it, make sure he knows what you have. Then you put it on the floor and with great fanfare, swoop a soup can down over it. Then you say, “Get the biscuit,” in an excited and encouraging tone. The score is based on how long it takes the dog to get to the biscuit. I thought I was starting with an easy one. The New Addition was the clear winner here. She took a sniff, turned to walk away and knocked the can over with her paw. She walked across the room, had a drink of water, strolled back and discovered the biscuit when she bent her head to allow me to scratch her ears. Twenty seconds! The next fastest was the Angel Straight From Heaven (ASFH), at 30 seconds. He also knocked the can over, and with his nose, although I still don’t think it was deliberate. 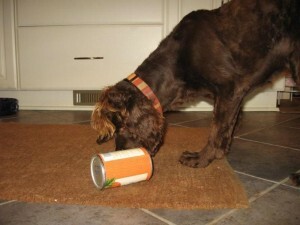 The spaniel walked away, the pointer stared at the can, then at me, then back at the can. The pit bull slid the can all over the kitchen, but never actually knocked it over. The next test is the more difficult version of that one. I was starting to sweat. The dogs were just excited that once again, we were playing with biscuits. This time, instead of hiding the treat under a can, you throw a dish towel over it. The ASFH knew exactly where that biscuit was. He picked it up, towel and all, and chewed it and chewed it and chewed it. If it crossed his mind that something was wrong, he was too polite to say. And he was smart enough not to swallow the whole thing. Both the pit bull and the New Addition managed to find the biscuit after I kind of propped the towel up a bit and maybe left just a tiny edge of biscuit peeking out. The spaniel walked away. The pointer looked at me, at the dish towel, back at me. When I told my sister about how passive the pointer is during all this testing, she suggested that the pointer isn’t food motivated. “What if there was a squirrel under that towel?” Good point. The thing to know about the ASFH is that for the first five years of his life, he lived in a pen. He lived in a pen the way a gold fish lives in a bowl. He didn’t go for walks or drives; he didn’t come inside during inclement weather, or get taken out for training or hunting or just to play. Someone brought him food and water once a day, most but not every day. I sometimes think he waited five years for me to come and take him home. As a result of this he has a patience unknown in the known world. He makes Gandhi look like a prison guard. I decided that wasn’t a good exercise for him. And the spaniel walked away with the towel. The next two tests were fun. These are tests of short term (15 seconds) and long term (5 minutes) memory. You take the dog into a room, show him the biscuit, and have him watch you place the biscuit in a corner. Then take him out of the room, turn him in a circle and lead him back into the room. Release him and say, in your encouraging and excited voice, “Get the biscuit!” All of my dogs lunged directly for the biscuit. The long term memory test has the same set up, but you put the biscuit in a different corner and take the dog out of the room for five minutes. Again, perfect scores for all dogs. OK, the spaniel didn’t actually get the biscuit on the second try, but just because the lighting was bad in that corner, so even though he was looking in the correct place he couldn’t actually see the biscuit. I gave him full points. He sure needed them. There are a few more tests that I haven’t gotten around to administering yet. I think I’ve discerned the trend and don’t really need to do any more testing. The trend suggests that my dogs aren’t all that motivated to perform. They are too polite to knock something over just to get at food. They are too calm to struggle to get out from under a blanket. But they can remember for days where you dropped a morsel of dehydrated lamb. Had I been a real tester, and an impartial scorer, the spaniel would be considered deficient. The test says about these dogs, “They will have a lot of problems negotiating life and can be extremely difficult to live with.” Naturally, he is the easiest dog I have, and a joy to live with. I’m not sure the same can be said for those gifted four year olds.